Researchers and clinicians have been investigating breast density for around 40 years and there is still a lot we do not know. However,  routine measurement of breast density as part of population based screening programs could change breast screening practices and enhance breast cancer prevention. Breast density measures have the potential to identify and target women at increased risk of the disease, especially when combined with other risk factors including family history. For example, women at high risk of cancer or masking of existing cancer could be offered different screening protocols and information on lowering risk. Conversely, women at low risk with low breast density could be screened less frequently thereby reducing anxiety and unnecessary mammograms. Breast density is typically measured from a mammogram (an x-ray of the breast). It is also referred to as mammographic density. A woman's breasts are made up of dense breast tissue and fatty breast tissue. Breast density appears white or bright on a mammogram. Fatty breast tissue appears dark. Breast density is sometimes described as a percent from 0% to 100%. For example, a mammogram could be described as 50% dense. Mostly fatty: The breasts are made up of mostly fat and contain little fibrous and glandular tissue. This means the mammogram would likely show anything abnormal. Heterogeneously dense: The breasts have many areas of fibrous and glandular tissue that are evenly distributed through the breasts. This can make it hard to see small masses in the breast. Pictured below are mammograms showing breasts from each of these categories. HOW COMMON IS DENSE BREAST TISSUE? Almost 8% of women aged between 40-74 years have extremely dense breasts (1). Breast density decreases with age, so dense breast tissue is more common in younger women compared to older women. 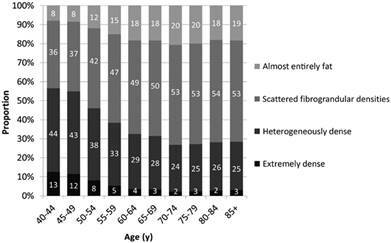 The graph below shows the proportion of women from the different breast density categories across different age groups. This graph is based on American data, but we think the proportions would be similar for Australian women. Distribution of BI-RADS breast density categories by age. HOW CAN I TELL IF I HAVE DENSE BREASTS? You cannot see, touch, or feel how dense your breasts are; a mammogram is needed to determine your breast density. IS BREAST SIZE RELATED TO BREAST DENSITY? No. Breast size does not relate to ﻿how dense﻿ your breast is on a mammogram. It depends on how much fat your breast has compared to connective tissue that makes up breast tissue. WHAT CAN DETERMINE MY BREAST DENSITY? Women of the same age vary greatly in their breast density. Studies of twin pairs and other relatives have shown that genetic factors are likely to be a major determinant of a woman’s breast density (2, 3). Some genes that are implicated in breast cancer have now been found to also determine breast density (﻿4,﻿ 5, 6). Breast density is affected by age, body mass index (BMI), having children, hormone replacement therapy, menopause, and family history (7, 8). Some of these are also risk factors for breast cancer. WHAT CAN CHANGE MY BREAST DENSITY? Researchers think that breast density is established when the breasts form, largely due to genetic factors, and then environmental factors may modify breast density over time. For example, having children reduces breast density and taking hormone replacement therapy can increase breast density. WILL WILL MY GP TELL ME IF I HAVE “HETEROGENEOUSLY” OR “EXTREMELY” DENSE BREASTS? There is currently no consistent protocol in Australia for women to have their breast density measured and reported. We advocate beginning a conversation with health professionals (for example, your GP or your radiologist at your next mammogram appointment) to facilitate breast density reporting. 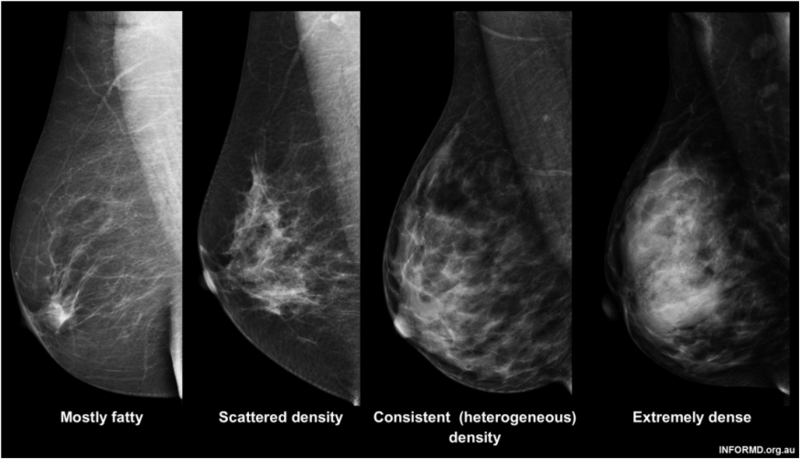 WHAT DOES IT MEAN IF I HAVE “HETEROGENEOUSLY” or “EXTREMELY” DENSE BREASTS? Having greater breast density for your age and size means that a woman is at greater risk of developing breast cancer in the future, and there is a chance that the density could hide a cancer on a screening mammogram. On a population basis, breast density is one of the strongest known risk factors for breast cancer (9, 10). On an individual level, when considering your own personal risk of developing breast cancer, it is important to take into account all of your risk factors in combination, not just your breast density. ​WHY DOES HIGH BREAST DENSITY HIDE CANCERS? Having a greater percentage of your breast covered with dense regions means that a woman is at a greater risk of having an existing breast cancer missed or masked (11, 12, 13). Both breast cancer and dense breast tissue appear white on a mammogram so the dense breast tissue can hide the cancer, making early detection more difficult. 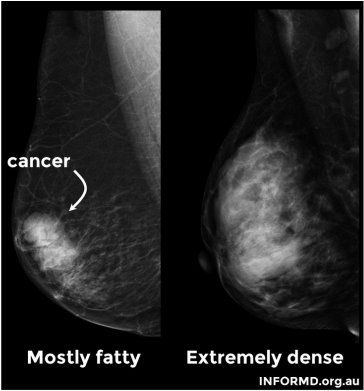 The mammograms below show a mostly fatty breast and an extremely dense breast. The arrow is pointing to a cancer which you can clearly see in the mostly fatty breast. It is more difficult to detect a cancer in an extremely dense breast, as it can be hidden in the dense tissue. WHAT CAN I DO IF I HAVE “HETEROGENEOUSLY” OR “EXTREMELY” DENSE BREASTS? This is a complex question and there is no straight forward answer. Being “breast aware” is important for all women, but particularly women with higher breast density. Get to know how your breasts feel and check them regularly. Any changes should be reported to your GP. Regular breast examinations can also be scheduled with your GP. There are supplementary screening options such as ultrasound and MRI, however use of these options comes with a high rate of false positives (a result that indicates that breast cancer is present when it is not). A false positive can be a distressing experience, with additional tests sometimes being required such as a breast biopsy. We encourage women to discuss their breast cancer risk with their GP or health professional, and make informed decisions about how to manage their individual risk. WHAT ABOUT MEN? IS IT A RISK FACTOR FOR THEM TOO? Approximately 1% of all breast cancers occur in men. We do not know if breast density is a risk factor for men because incidence is so rare. HOW CAN I GET INVOLVED IN BREAST CANCER OR BREAST DENSITY RESEARCH? Register4﻿﻿ brings together researchers and people who share one common goal – to help deliver greater health benefits from cancer research faster. 1. Sprague BL, Gangnon RE, Burt V, Trentham-Dietz A, Hampton JM, Wellman RD, et al. Prevalence of mammographically dense breasts in the United States. J Natl Cancer Inst. 2014;106(10). 2. Boyd NF, Dite GS, Stone J, Gunasekara A, English DR, McCredie MR, et al. Heritability of mammographic density, a risk factor for breast cancer. N Engl J Med. 2002;347(12):886-94. 3. Stone J, Dite GS, Gunasekara A, English DR, McCredie MR, Giles GG, et al. The heritability of mammographically dense and nondense breast tissue. Cancer Epidemiol Biomarkers Prev. 2006;15(4):612-7. 4. Brand JS, Humphreys K, Thompson DJ, Li J, Eriksson M, Hall P, et al. Volumetric mammographic density: heritability and association with breast cancer susceptibility Loci. J Natl Cancer Inst. 2014;106(12). 5. Lindstrom S, Thompson DJ, Paterson AD, Li J, Gierach GL, Scott C, et al. Genome-wide association study identifies multiple loci associated with both mammographic density and breast cancer risk. Nature communications. 2014;5:5303. 6. Stone J, Thompson DJ, Dos Santos Silva I, Scott C, Tamimi RM, Lindstrom S, et al. Novel Associations between Common Breast Cancer Susceptibility Variants and Risk-Predicting Mammographic Density Measures. Cancer Res. 2015;75(12):2457-67. 7. Huo CW, Chew GL, Britt KL, Ingman WV, Henderson MA, Hopper JL, et al. Mammographic density-a review on the current understanding of its association with breast cancer. Breast Cancer Res Treat. 2014;144(3):479-502. 8. Stone J, Warren RM, Pinney E, Warwick J, Cuzick J. Determinants of percentage and area measures of mammographic density. Am J Epidemiol. 2009;170(12):1571-8. Epub 2009/11/17. 9. Hopper JL. Odds per adjusted standard deviation: comparing strengths of associations for risk factors measured on different scales and across diseases and populations. Am J Epidemiol. 2015;182(10):863-7. 10. McCormack VA, dos Santos Silva I. Breast density and parenchymal patterns as markers of breast cancer risk: a meta-analysis. Cancer Epidemiol Biomarkers Prev. 2006;15(6):1159-69. 11. Boyd NF, Guo H, Martin LJ, Sun L, Stone J, Fishell E, et al. Mammographic density and the risk and detection of breast cancer. N Engl J Med. 2007;356(3):227-36. 12. Kolb TM, Lichy J, Newhouse JH. Comparison of the performance of screening mammography, physical examination, and breast US and evaluation of factors that influence them: an analysis of 27,825 patient evaluations. Radiology. 2002;225(1):165-75. 13. Ma L, Fishell E, Wright B, Hanna W, Allan S, Boyd NF. Case-control study of factors associated with failure to detect breast cancer by mammography. J Natl Cancer Inst. 1992;84(10):781-5.